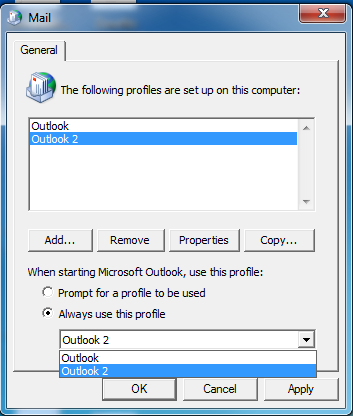 If you already have an Outlook profile, you will want to add a new profile for your SureMail. *If you have not previously setup an Outlook profile, launch Outlook and skip to step 8. Name the new profile (this should be different from the previous profile name). The next screen will allow you to setup your SureMail account automatically. On this screen you should enter your name, your email address and your SureMail password. *You may not see this screen appear. Instead, you may see a screen to Connect Outlook to Office365. Click the blue Connect button on this screen, and skip to step 12. A message will appear asking you to Allow this website to configure server settings. Select the Don't ask me about this website again checkbox, and then click Allow. Outlook should now ask for your password again. Put in your SureMail password, and click Save Password. 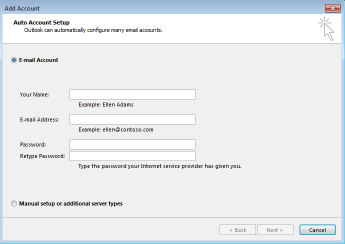 *If this was the first email account setup in your Outlook, skip to step 16. The Mail Profile box should still be open. Look for the Always Use This Profile radio button, and select the new profile name you just created from the dropdown menu. If you already have emails in your inbox, allow time for propagation of data from the email server - can be up to 24 hours depending on the size of your mailbox.